CBSE Improvement Exam 2019 -20: CBSE will release the Improvement exam result tentatively in Last week of April or May 2019. CBSE provides an opportunity for the students who want to increase their score in the board exams. The last date to apply application form without late fee was November 17, 2018. Candidates who have passed the board exam but are not satisfied with the score secured can opt for this option. It should be noted that the only those candidates will be eligible to qualify for this exam who have qualified the board exams. For the CBSE Improvement exam 2019, the student has to follow up the prescribed procedure as per defined by CBSE which includes filing up the Improvement form has been made available by the examination conducting body of the Board. The candidate who appeared for the March 2018 exam and is not satisfied with her/his Result can give the improvement of the selected subjects in the Board exam of March 2019. For more of the details go through the article below. CBSE will release the Improvement exam result tentatively in the last week of April 2019 or May 2019. The direct link will be available here. In the latest announcement made by the Central Board of Secondary Education, the examination conducting body has decided of conducting the board exams a little earlier for 2019 session. Some changes are being introduced in the exam dates of CBSE for both class 12th and class 10th. The new date sheet will be released in the Second week of October 2019. Candidates should note though that the exam of Vocational Subjects will be held in February 2019 but the exam of Core Subjects will be conducted in March 2019. These changes are welcome on the basis of the recommendations from the committee which was formed in April 2018 with the purpose of bringing changes and improving CBSE Board Exams. These changes in the timetable of CBSE Board Exam 2019 will impact the conduction of the Improvement Exam which is also held along with the Board exams. There are definite chances that the Improvement Exam 2019 for Vocational Subjects will be held earlier too. Candidates who are planning on appearing for the CBSE Improvement Exam 2019 will get a chance of Improving their result earlier so that the opportunity of applying to the Universities for the admission to the preferred courses will not be missed. For More Details regarding the changes in CBSE Board Exam Schedule 2019- Click Here. As per the latest announcement made by CBSE regarding the changes in Math Syllabus for class 10th Board Exam of 2019 it has been stated that the students of class 10th will be provided with the choices of two sets of Math Paper. One will be the standard level Math Paper and another one will be the existing level Math paper. Students will have to choose as per their preference where the standard level will be less difficult for those who are not planning on pursuing Math further and existing level will be little more difficult for those who are planning on pursuing the subject for Higher studies. Candidates appearing for the Improvement Exam 2019 will not be provided with such form of opportunity and the pattern of the question paper will be the same as per they appeared in the last year. Candidates will have to prepare from the topics which they appeared for in their 2018 exam and there will be no form of changes in the examination pattern or question paper for the candidates applying for Improvement. The Releasing date of CBSE Improvement Exam 2019 for all the candidates was 23rd October 2018. Candidates must note that the Applications for all the candidates applying for CBSE Improvement Exam is same. Regular as well as Private Candidates will have to fill up the same Application Form. As there has been no announcement made by the Central Board of Secondary Education regarding the conduction of Improvement Exam CBSE 2019, candidates are facing confusion related to the exam and whether the Application Forms will be released or not. It is very natural to come up with all these queries especially when all the information you are getting is making you more confused. The most frequent query asked is regarding the availability of the Application Form, procedure of the Application Form or the basic eligibility conditions in order to appear for CBSE Improvement Exam 2019. 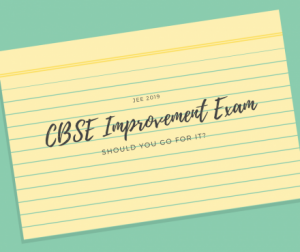 Ques: What are the CBSE Class 12th Improvement Form and why they are released? Ans: The Improvement Exam of class 12th is held by CBSE every year. It provides an opportunity to the candidates who have already appeared for CBSE Exams but haven’t secured the satisfactory marks in the exam are provided with this option. But it should be noted that only those who HAVE GIVEN the CBSE Board Exam will be eligible to give Improvement exam. Those who haven’t appeared for CBSE exam or were absent in any of the subject will not be eligible to appear for the Improvement Exam. Ques: Can I take CBSE Improvement Exam 2019 if I passed class out class 12th in 2017? Ans: Yes, you can appear for CBSE Improvement Exam 2019 if you passed your 12th exam in 2017. Candidates from 2017 and 2018 batch are eligible to appear for Improvement exam 2019. Ques: Are CBSE Improvement Exam 2019 Form released? If Not, when they will be available? Ans: CBSE Improvement Exam 2019 Application Form are released on the official website of CBSE. CBSE Improvement Exam 2019 Form released in the month of October 2018. Ques: If the candidate has failed in all the 5 subjects in class 12th exam, are they eligible to appear for the 2019 CBSE Improvement Exam? Ans: No, if you have failed in all the board exams, you are not eligible to appear for the Improvement Exam. The candidate is required to pass in the exam in order to appear for CBSE Improvement exam 2019. Ques: In the new Marksheet of CBSE Improvement Exam 2019, are marks of all the subjects are mentioned or only those for which the candidate appeared for the Improvement? Ans: The new Marksheet which will be released after the Improvement Exam will mention the marks of only those subjects for which the candidate gave the Improvement Exam for. The candidates passed in 2018 and 2017 can apply for the improvement examination. Students can choose more than one subject for improvement. The application fee may increase as per the number of the subject chosen. After the CBSE improvement exam 2019 result, you can prefer the latest result or improvement result. The students before planning on the filling of the CBSE Improvement Exam 2019 are advised to go through the eligibility criteria as per described by CBSE Board. It should be noted that the candidate will be prohibited if the criteria are found not to be fulfilled by the Board. To appear for CBSE Improvement Exam 2019, the student is required to be passed in the Board Exam that they appeared for. For those who failed the exam, there are different provisions for which they can go for. Improvement exam is solely for the candidates who want to raise their score secured by them in the Board exam. Candidate must have studied from CBSE Board. If the candidate has a compartment in any subject, she/he will not be eligible to appear for the Improvement exam. Candidate cannot choose any additional subject for reappearing. The option of giving improvement is only for the Five main subjects. Candidate can apply for improvement for anyone subject or for all the five subjects. If a candidate passes the exam in 2018, she/he can appear for the exam in 2019. Navigate for the Apply Online Link to Improvement Exam on the Home Page. Candidates will be required to enter their School name and Roll Number. Next option will be of choosing the subjects in which the candidate wants to appear for the improvement. Select the examination centre out of the given choices. Go through the filled details thoroughly and click on the submit button. Pay the Application Fee either online or Bank Challan. It is advised to get the print out of the Application form for the future reference. The application fee is Rs. 200 for all candidates. The application fee can be paid in online mode or via challan. Exam Fee for five Subjects under All India Scheme. Fee for additional six Subjects under All India Scheme. Fee for the practical exam under All India Scheme. Fee for two subjects for improvement under All India Scheme. 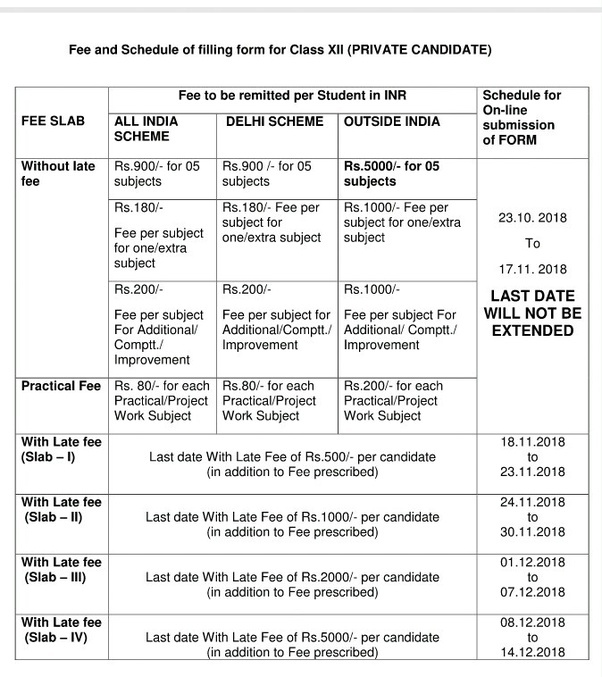 Under Delhi Scheme Fee for two subjects. Fee for three or more subjects for improvement under All India Scheme. The CBSE Improvement Exam 2019 Admit card has been made available by the examination conducting body. Candidates who have filled up the Application form for the Improvement exam will be eligible to download the Admit card by providing their Application Number of the Improvement Form. The Admit Card for the candidates who have applied for the Improvement exam will be available along with for those who will be appearing for the regular board exam. It should be noted that the admit card is an important document to be bought on the day of the exam and in its absence candidate will be prohibited from taking the exam. The Result of CBSE improvement Exam 2019 will be released by the CBSE on the notified date along with the result of the Board exams. Candidates who appeared will be required to provide their Roll number for finding the score. It should be noted that the marks secured in the CBSE Improvement exam will be considered as the final score and the new mark sheet will be issued with the revised scores of the subjects for which the candidate has given the exam. It is important that the candidates go through both the Merits and Demerits before appearing for the CBSE Improvement exam 2019. The Improvement Exam is held by Central Board of Secondary Education (CBSE), providing an opportunity for the candidates to increase their marks in the subjects. Appearing for CBSE Improvement exam involves both the Advantages and Disadvantages while the Advantage can be that the score of the candidate will be increased if the exam goes well but in case the candidate is not able to prepare well, her/his score might get lower. CBSE Improvement exam is applied by the candidates mostly with the assurance that the score will increase which will help in the overall aggregate improvement of the marks. Click Here to Read Advantages and Disadvantages of CBSE Improvement exam 2019. Go through the points mentioned below if applying for Improvement exam CBSE 2019. The Applications for CBSE Improvement Exam 2019 will be made available on the official website of CBSE in October 2019. The CBSE Improvement Exam 2019 Form will be made available on the official website of CBSE. Candidates should keep themselves updated with the released information. CBSE Improvement Exam 2019 is given by the candidates for the increment of marks in their board exams. The candidates applying for CBSE Improvement 2019 will be able to appear for one subject for improvement or can appear for more than one subject. If the marks secured by the candidate in CBSE Improvement 2019 will be more than the secured marks, the new score will be on the mark sheet. If the Improvement marks remain less, the secured Board exam marks will remain on the mark sheet. It will be important for the candidate to go through the fee as charged for the papers applying for the Improvement. Before filling CBSE Improvement Form 2019, it is advised to go through the eligibility as defined by the Board. In case the candidate is found not fulfilling the eligibility, they will not be permitted to sit for the exam. Only those candidates can apply for CBSE Improvement Exam who have passed the exam and wants to increase their score. Candidates who have failed in their board exam will not be allowed to apply for CBSE Improvement 2019. So here, we have provided some FAQ’s which are mostly asked by the candidates. Question – If I’m giving CBSE class 12th Improvement exam in 2019 to get 75% marks in PCM. Do I have to give JEE Main in Jan 2019 or can I give it in April 2019? Answer – If the candidate is appearing for class 12th Improvement exam in 2019, they are eligible to appear for JEE Main January 2019 as well as April 2019. Question – What if one wishes to improve his/her performance in Chemistry and Mathematics in class 12. Is it possible and how? Answer – Yes, it’s possible. Candidates need to fill the CBSE Improvement Exam Form 2018 for the subjects in which they want to improve their scores. The candidates may appear privately or as regular students who want to appear for all subjects. Question – How many times one can appear for the Improvement examination? Answer – Candidates have only one chance to appear for the examination in the consecutive year. Question – Is it possible for a candidate to appear simultaneously for CBSE Improvement as well as additional subject examination? Answer – No, it’s not. As per the CBSE Improvement Exam Rules, the candidates can appear for examination in one or more subjects to improve their marks, but they can’t apply simultaneously for additional subject examination. Question – Is it compulsory to appear in all subjects in improvement exam CBSE 2018? Answer – No, students can apply for one or more subjects as per their choices as mentioned in the CBSE improvement exam rules. Question – Is it compulsory to appear in theory and practical exams in the improvement examination? Answer – If candidates have passed in practical in the main examinations, they are permitted to apply only to the theory part in CBSE class 12 Improvement Exam. And marks of practical scored in the main examination are carried forward and counted as it is. Or if the candidate has failed in practical then they have to apply for both practical and theory in the exam according to CBSE Improvement Exam Rules. CBSE Re-evaluation Exam: Along with a CBSE Improvement Exam 2019, candidates who are not satisfied with their marks in class 12th and class 10th are also provided with an opportunity of re-evaluation where the improvement of marks in the Answer Sheet can be done. The procedure of re-evaluation is conducted by CBSE for which the candidates have to apply by submitting the different Application and mention the subject in which they want their marks to be rechecked. In this process, candidates who are confident regarding their performance in the board exam but have secured fewer marks unexpectedly can visit the official website of CBSE and apply for CBSE re-evaluation procedure. Under this, the sheet of the exam for which candidate applied for the re-evaluation will be rechecked by the authorized teachers. It should be noted that only the marks will be recalculated and it will be checked if during the total calculation all the marks have been included and calculated properly. Candidates should note that there is no assurance regarding the increment of the marks in the CBSE re-evaluation procedure and quite many times it has been seen that the efforts go in vain. It is advised that the candidates apply for the CBSE Improvement exam in which there will be an opportunity for increasing the score and prepare for the exam in a much better way. Mam i apply for three subjects to improve my marks if any one of my subjects have marks less than previous one then in my new Dmc which marks is shown previous one or new one?? Your new marksheet will provide the new score. But your previous score will also be considered. Is the improvement exam admit card actually out? When I click on the link, it shows runtime error and never opens. I’ve tried it a lot of times, has anyone downloaded the admit card yet? Maine math and chemistry me improvement exam K liye form dal rakhha hai but Mai kewal math ka exam Dena chahata hu to chemistry ko lekar koi problem to nhi hogi? . Result kya ho Sakta hai ? There will be no problem in Chemistry. Aap jis subject ka exam doge sirf uska hi result aayega. Sir I am unable to open the admit card page as it is showing run time error..
How can I download my improvement exam admit card 2019..?? Pls provide me link. Server error problem. some time links not open but around 4:30 admit card link open successfully. sir on the chemistry paper date ,my bsc paper is also on that date so what i do? Kindly contact the examination authorities of your college if they can provide any form of help in your case. what are the documents to be submitted to cbse for class 12 improvement exam 2019?? Original Marksheet and Certificate has to be submitted to CBSE. If you have filled the Application Form providing all the details, you can send the Confirmation Page. If your Application has been successfully submitted it will not be rejected even if your documents reached the regional office late. I posted my cbse improvement application 2019 to the regional office however it reached the office on 19 Nov but the last date was 17 Nov, will my application be rejected or will I have to late fee? Nahi is ki koi jarurat nahi hai…. aapne post kar diya bas yahi kafi hai…. mene application form bhar diya h. kya mujhe fee status aur confirmation page cbse regional office me jaake submit krna pdega? There is no guideline regarding the submission of the confirmation page. The date for the Application Form submission is already over. Admit Card will be available soon. My form has been filled easily, but there is a problem in money transaction. The applications will be closed soon. I have tried with a good internet collection. Please help me out? Is no one else having any problem in transaction? I have completed my 12th in 2017 with minimum approx marks in maths and physics. Can i improve my result from improvement 2019. I have filled my improvement exam application form, but the transaction is not being successful. I have triesd a lot of times, but it fails everytime. What am I supposed to do now? If the amount has not been deducted it is suggested that you try filling the Application again with a good Internet connection. I am a 2017 batch pass out. Am i eligible for CBSE Improvement 2019 exam? If you passed class 12th under Vocational Stream in 2017 you can apply for 2019 Improvement exam provided that you didn’t appear for 2018. Maine all subjects improvement exam fill kiya hai pr agr mere sirf ek subject mai kam marks aye as compare to purane vale marks ke ……toh kya mere sirf us subject k liye pechle marks lag skte hai??? Aapki nayi marksheet mei wo marks aayenge jo apne Improvement exam score kiya hai. Jis subjects mei marks pichle exam mei jyada the or Improvement dene ke baad usmei kam aaye, uske purane marks hi consider kiya jayenge. Aapki dono hi marksheets valid hai. Mam maine application form bhara par aange procced krne ke liye application number aur roll number manng rhe h aur jab mai daalti hu toh woh invalid application number bol rhe h help me????? Aapke Application Form number mei koi problem ho sakti hai. Agar final submission or payment nai kiya hai to dobara se Application bhar sakte hai. Sir confirmation page download hone ki option to hai hi nhi. Isbar ki notice me cbse ne confirmation page bhejna hy ya nhi kuch nhi kha hy.please clear kare.or kaise download hogi btaye. Confirmation page CBSE regional office ma bhejna ha??? Address aap k confirmation page k sabse upar likha hua hai… or confirmation page par niche ki taraf candidate signature bhi likha hua hai…. toh tum waha apna sign kar dena…. confirmation page ka ek photocopy apne pass bhi rakhna… taki jab admit card aayga.. tab tuhme application no. Ki need hogi… ok beta…. Regular candidate improvement ke liye private candidate ka through apply karte hain na please reply??? Mam when i filling improvement application form then year of examination can not not be display 2017 only show 2018. Kya main 2019 ke liye apply kr skta hu? Agar aapne 2018 mei Board pass kiya hai, aap tabhi Improvement Form bhar sakte ho. When i apply then year of passing exam not be displayed only they give option 2018 not for 2017. Now how to apply to 2017 passed student. Please reply me sir and suggest. If you have passed your exam in 2018 then only you can fill the Improvement Form. If you have passed class 12th under the vocational stream in 2017 only then you can apply for Improvement Exam in 2019. My son is appearing for the Improvement Exam for 12th CBSE Board in Physics, Chemistry & Math. If his new marks in Math & Chem r more than previous marks but marks in Phy is less than previous marks, what will be his final marks in Physics, Chemistry & Math. If he secures less marks in Physics, his previous marks will be given preference. The new mark sheet will mention the new marks but the previous one will also be valid. The address that you have entered will be considered. Agar aap apna CBSE Improvement Exam form bhar ke submit kar paa rahe ho then please let us know. Yes, aap yahi form fill kar sakte ho…..
Mam mera maths ma compartment Laga tha fir mana July ma compartment clear kar dia,kay ma improvement la lia eligible hi?? MAM PLEASE SUGGEST MA!! PLEASE! PLEASE! Haa aap Improvement Exam de sakte ho. Aapko Application bharne mei problem isliye ho rai hai kyunki ye forms Private Candidates ke liye nikle hai. Agar aap regular students the to aap ye form nai bhar sakte ho. Sir ,I have cleared Compartment exam in math, can I give improvement exam? Yes, you can give the Improvement Exam. Improvement Exam Application ka link private candidates ke liye release hua hai. Aapko article mei link mil jayega. Mam when will the improvement form in our reach please inform . On which date improvement exam form will be available Plzz give your right information…. Improvement Exam Forms for Private Candidates are released. Find the link in the article above. Aap jin subjects mei fail ho wo Pehle pass Karne honge. Aap CBSE improvement ka form apply kar sakte ho… but aapko failure wale option se apply karna hoga… wo bhi all subjects se…. Improvement exam Forms will be available soon. No, you will have to pass your Compartment Exam first. Improvement Exam forms will be released soon. CBSE Improvement Exam forms will be released soon. My subjects in 12th exam 2018 were MATHS, PHYSICS, CHEMISTRY, ENGLISH, COMMERCIAL ART. I failed to secure 75% and I am preparing for the JEE-2019. Can I give improvement in all of the five subjects?? Yes, you can appear for Improvement in all the five subjects. aap kam se kam 1 subject or 1 se jayda k liye bhi apply kar sakte hai… because you are preparing for JEE (Main) exam 2018…. and JEE (Main) is ko accept bhi karta hai…. The improvement exams 2019 will be held for sure na? Also, if a person is going to give JEE MAINS 2019 then are we supposed to take improvement exams of all the subjects? And will the result of improvement exams be the same as board results? Are cbse improvement exam 2019 form for class 12 have released? No, the Application Forms for CBSE Improvement Exam are not released yet. The Forms will be released soon. It will be updated in the article. 12 class Improvement forms are available or not? The Improvement Exams Forms will be released soon. The Improvement Exam forms for class 10th and class 12th will be released soon on CBSE website. how many subject improvement exam can a student give . You can give an Improvement Exam for all the subjects that you had in your class 12th or class 10th. You should have passed in the exam then only you can appear for the Improvement exam. When Will improvement exam forms be available for 12th?? Yes, Improvement Exam forms will be available form class 12th. When will be application form for improvement exam will be released.. please menson the date sir.. The Applications will be released soon. Keep visiting the article, it will be updated as soon as the Applications are released. how will i get my improvement marksheet ??????? It will be released once the result of Improvement Exam is released. Namaste madam, cbse improvement ka form kab tak aayega? Ma’am agar maan lo ki mere no. Improvement exam me is baar se kam aaye to konse no. Ko preference di jayegi? Ma’am me chemistry me theory me fail hu to kya m chemistry ka improvement exam de sakta hu? Chemistry meri additional subject h? Please tell me ma’am clearly. Improvement Forms will be released soon. Agar Improvement Exams mei marks Kam hai to pehle wale marks ko preference di jayegi. Agar Chemistry Theory mei fail ho to Improvement Exam Nahi de sakte ho. Yes, if you have cleared the Compartment Exam you can give the Improvement Exam in that subject. Will the improvement exams be held with 12th board exams? And will the result come out with them as well? Yes, the Improvement Exam will be conducted along with the Board exams and result will be announced with the Board exams. Any changes will be updated in the article as soon as the notification is released. The Exam will be conducted. The Application Form will be released soon. Has the application for improvement exam cbse 2019 closed? The Application Form for CBSE Improvement Exam 2019 has not been released yet. Cbse improvement exam application form realise will be ??????? The Application Forms will be released soon. The forms are not released yet. It will be updated in the article as soon as it is released. When the cbse improvement exam date released for exam 2019? The exam date for Improvement exam 2019 is not released yet. It will be updated in the article as soon as it is announced. My brother got low marks in accounts & Economics in 2018 12th examination, so he wants to appear for improvement exam 2019, i want to know if in any case he got low marks again & even below the previous marks, so which of the marks will be valid. If he scores low marks in his Improvement Exam, his previous marks will be given preference. Date will be updated in the article as soon as it is released. You can appear for the Improvement exam only once. If you have already given the exam earlier, you are not eligible to appear for it again. When will cbse class 12 improvement exam date will release? The date is not announced yet. You will have to appear for the Compartment Exam again in 2019. The Link will be updated in the article. The Application Form date is not announced yet. The date will be available in the article soon. I’m pursuing a degree but i want to give improvement exam . Im eligible or not? If you passed your Board exams in 2017 or 2018, you are eligible to appear for the Improvement Exam. I am 2017 passout student and appeared in 2018 for improvement examination but was unable to score well. Can i again give improvement examination in 2019 ? You can appear for the Improvement exam only once. Since you already gave Improvement in 2018, you are not eligible to appear for Improvement Exam in 2019. The Forms of Improvement Exam will be released soon. Please go through the article for the steps to fill the Application Form. The expected date for the Registration of Improvement exam is in October 2018. The exam will be held in March 2019. Dates will be announced soon. The expected date for the Improvement Exam will be in March 2019. The link of the Application Form has not been released yet. We will update it in the article as soon as it is available. If a candidate failed in 3Subject can he/She appear in improvement exam of year 2019 exam..? If you have failed in your subjects, you are not eligible to appear for the Improvement exam. Appearing improvement for all five subject is necessary or not? Aapki choice pe hai, saare subjects ka Improvement bhi de sakte ho or sirf ek subject ka bhi. Mam I scored 23 in theory and 28 in practical am I pass because according to guidelines I need minimum 33 percent to pass and everyone says 23 is minimum number to pass. Kindly help what should I do if I am not eligible for improvement exam I have filled jee mains form also and there I have stated that I will give improvement exam. If you have secured 23 in Theory and 28 in Practical, you have passed the exam. 33 marks are needed in total to pass the subject. 23 is the minimum number to pass in the theory exam. You are eligible to appear for the Improvement exam in 2019. When cbse release improvement form 2019….??? CBSE class 12 improvement exam 2019 application form starting date? The Date for the Application Form will be announced soon. Mam I scored 23 in chemistry theory am I pass? No, you will need to appear again for the exam. The dates haven’t been announced yet. They will be updated in the article. Sir i have passed in all the sub. But scored less if i will give improvement in all and if i got fail in any one subject in improvement exam than what will happen plzzzz sir tell me plzzz iam so warry about this. If you fail in any subject in Improvement then your board exam marks will be considered. The compartment exam will be conducted in March/April 2019. CBSE class q2th improvement exam form date….?? No Date for the release of Improvement exam has been announced yet. No date has been announced yet. The Application Forms for Improvement exam will be releasing soon. The Application Forms will be released soon in this month (October) 2018. Agr additional subject mai fail hu toh us subject ka mai kya improvement de skta hu? Agar aap fail ho to Improvement exam nahi de sakte ho. If you have failed in one subject, you cannot give Improvement of that subject. The forms will be released tentatively in October 2018. The forms will tentatively be released in this month (October). hello sir; Sir i have failed in 1 subject [science] that i am re exam at all subject or only 1 sub.science. plys give me answer for my quetions ? Jis subject mei fail hai, uska exam dobara dena hoga. Sir , CBSE improvment application form kab aayega of class 12. The Applications for CBSE Improvement will probably be released in October 2018. Please notify me when cbse class 12 improvement forms will release. The Forms will tentatively be released in October. Actually I got a compartment again in my cbse boards exam so I have to give exam during boards or during compartment exams? You will have to appear for the Compartment Exam. When will the results of the improvement examinations be declared? The Result of the Improvement exam will be declared along with the result of Board Exam. If you gave your Board exams in 2017, you can appear for CBSE Improvement exam 2019. If any student becomes unable to score more marks to the previous year than which marks will be given to that student ? If you are not able to score higher marks in your Improvement Exam, the marks secured in your Board Exams will be considered. Pichle saal wale marks prefer kiye jaayenge. 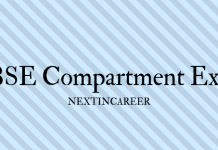 i wahttps://nextincareer.com/cbse-improvement-exam-2019/#respondnt to known that when was the improvement examination form available!! The forms will most probably be released in this Month (October 2018). Actually I am given a improvement exam for 12class for increasing marks but there is no date come for form filling date plzzzz sir or mam plzzzz help me given me a actually date for improvement date form fill.. The forms will be released probably in October 2018. The link will be available in the article. If i have given 12th board from indore m.p anf now i am in gwalior can i give improvement exam from gwalior ? These details will be clear once the forms are released. Please kindly mail me… Whenever forms are released to my mail.I Am quite worried about it. Please keep visiting the website. The direct link for the form will be available here. When will cbse class 12 th improvement form for 2019 exam come?? They will most likely be released in October 2018. I passed class 12 in 2016 and I have given improvement exam in 2018 can I give exam in March 2019 for further improvement ?? Candidates who gave Board exams in 2017 or 2018 are eligible to appear for 2019 Improvement Exam. If you gave board exam in 2017 or 2018, you are eligible to appear for Improvement Exam. No date has been announced soon. Any latest information will be updated in the article. Date announce nai hui hai. When cbse improvement form 2019 will released?? It will be releasing soon. No date has been announced yet. The Improvement Exam Application Date will be announced soon. Yes, and you will not be eligible to give the Improvement exam. Application Form Date will be announced soon. Inform me when the cbse improvement form available. If we gave improvement exm & marks will be less then class 12th bords exam ! Which marks will be count ! The marks you secured in the board exams will be given preference. Dates will be released soon. When will be the improvement exam of cbse class 12? The exam will be held with CBSE 2019 Board in February or March next year. The official datesheet will be available soon. When will application form out for CBSE class 10th improvement exam 2019? The date has not been announced yet. Please keep visiting our website for latest notifications. I want the exact date of improvement exam form for 2019 as per i will prepare myself for the exam and i was eagerly waiting for the form of improvment exam. So please help me to figure it out. The expected date for CBSE Improvement 2019 Application Form is in October 2018. When class 10 improvement registration form released date. All the important information is provided in the article. If you have a compartment in Biology, you are NOT ELIGIBLE to appear for CBSE Improvement Exam 2019. If you are planning on appearing for the Improvement exam in order to increase your score for JEE Main, it is advised that you try the improvement of marks in Physics, Chemistry and Mathematics. From when will be the improvement examination form available? The forms will be available soon. We will update it as soon as it is released. Yes. Improvement Exam can be given in all the five subjects. The dates have not been announced yet. We will update it as soon as it is announced. CBSE Improvement Exam 2019 forms will be released soon. For all the important information regarding CBSE Compartment exam click here for the article. Please find the procedure of filling the Application Form in the article. If you were absent from your class 12th Math exam, you are NOT Eligible to give Improvement Exam. It is only for those candidates who have appeared for the exam and wants to increase their marks. Yes, you can. Once the Applications forms are available. No date for the Application Form has been announced yet. I want to know what is the date of aplication form for class 12 improvement exam 2019 please kindly notified it. No Official date has been announced yet. No Notification regarding CBSE Improvement has been released yet. We will update as soon as it is available. If I write only physics, chemistry and biology for improvement exam.Will I get the other subjects marks added in the new marklist? Your marks in the other subjects will remain the same in your new Marksheet. can the centres be changed? There will be chances of centres being different. It will be clear once the official notification of CBSE Improvement is released. Application Forms will be released soon. No announcement has been made yet. The Application Form for Improvement hasn’t released yet. It will be updated in the article as soon as it is made available. No, Improvement Exam Forms hasn’t been released yet. They will most probably be released in the coming week of September or in October. Any latest notification will be updated in the article. cbse improvement exam 2019 application form date for class 12 . The Application Form date for CBSE Improvement of class 12th hasn’t released yet. The date will be updated in the article as soon as it is released. Hello ma’am, can we fill the improvement exam form as a private candidate on cbse site or do we have to fill via a school? Yes, you can fill the Improvement Exam form as a Private Candidate. You can give Improvement exam for the subject in which you want to increase your score. The improved marks will be valid for JEE Mains 2019 and will be beneficial at the time of the admission. If i want to give jee mains and advance so it is compulsory to give improvement in all subject? The improvement exam can be given in one or more than one subject. If you want to give JEE Mains and Advance, it is not compulsory to give Improvement exam in all the subjects but only in those in which you want to increase your marks. mam can we download our admit from the official website or should we need to collect it from the respective schools. You will need to collect the Admit Card of Improvement exam from the respective school. If you have failed in three subjects, you are NOT eligible to give Improvement Exam. i passed in my practical exams but marks are very low,,, can i give improvement exam? If you have secured less marks but have passed those subjects, you can appear for CBSE Improvement exam 2019. I have appeared in the improvement exam 2018.Can i fill the improvement form in 2019 on my previous result & roll number? I have passed in 2016. No, you won’t be able to appear for 2019 Improvement exam if you have passed in 2016. Only Candidates who have passed in 2017 and 2018 board can appear for CBSE Improvement 2019 exam. I passed cbse exam 2018 pcb is my main subject physics chemistry I got good marks but biology not good marks it show ft but my results show passed can I attend improvement exam 2019 ..
CBSE Improvement Exam is conducted for those candidates who want to increase their board exam marks. If you have passed in Biology but haven’t secured good marks, you ARE ElIGIBLE to give CBSE Improvement Exam 2019 to increase your score. And if you have failed in Biology, you WILL NOT BE ELIGIBLE to appear for CBSE Improvement Exam 2019. Sir , my results show pass but biology show fail in theory , can I attend to improvement exam 2019. If you have failed in theory in Biology, you are not eligible to appear for the Improvement exam 2019. I passed in 2018 in all subjects. suppose I apply for 2019 improvement exam in all five subjects MATHS, physics, chemistry,english and physical education. In comparison to my 2018 scores, if I get improved in 3 subjects but get less marks in other 2 subjects(less than scores of last year in those particular subjects). The improved scores of 3 subjects will be there in new result.But which scores of other 2 subjects will they show in new result? more marks of previous year or less marks got in improvement exam? How will they allot me marks in all 5 subjects in my new result? If you give Improvement exam for all 5 subjects and score more marks in 3 subjects but less marks in the other 2 subjects, in this case, your new Result will mention the increased score of the 3 subjects and your previous marks (that you scored in Board which were more than you secured in Improvement)of the other 2 subjects will be mentioned in your new result. Please respond if there is still confusion. You cleared out my vision perfectly.I am really thankful to you Mam. I was struggling through this confusion for long. Thanks a lot to you for giving us your precious time and guidence. Salutes. Naye result mei sirf wo marks aayenge jinka Improvement exam diya hai. When cbse improvement results will be annonced? The exam will be conducted in March 2019 and result will most probably be released in May 2019. Please keep visiting our website for the latest updates. I’m failed in class 12th 2018 in all 3 subjects i.e., PMC so can I apply for improvement this year. You will have to apply now but the exam will be conducted in 2019. I got 60% in 12 board ,filled the same in Jee mains 2019 (jan) form. I am giving CBSE improvement exams ,will my new percentage automatically updated or I should wait till april. Your marks in JEE Main 2019 (Jan) Form will be the same that you entered at the time of form submission. There is no provision of new marks being automatically updated in the form. The exam of CBSE Improvement will be conducted in March 2019 and result will be declared by May 2019. The form of JEE Main April 2019 will be released in February 2019. English, physical education and hindi but I have fail in physics and overall pass in examination so I want to take admission in MBBS for taking admission in mbbs pass in physics is compulsory then I will give the compartment of physics or give improvement in physics please tell what I will do ??? You cannot take the compartment exam in any subject now. I gave my boards exams in 2018. I had maths as an extra subject in class 12. I got failed in it but overall i was pass because of my other 5 subjects. I want to give maths exam so would i have to apply for Imporventment exam or for compartment exam?? First you will have to take the compartment exam for Maths. After qualifying in that, you can apply for Improvement exam next year. No, you cannot take the improvement exam now. Having passed 12th in 2016, you were allowed to take the improvement exam in 2017 or 2018 only. Can a student appear for improvement exam after clearing the compartment exam ?? Yes you can clear a compartment exam and then appear for an improvement exam but only in the succeeding year. i cant find link for applying for improvement exam. The Application forms for CBSE Improvement hasn’t been released yet. The link will be available as soon as it is released. If i gave 6 subjects out of which i have passed 5 subject..like passing in maths bio. Physics english and PHE but failed in chemistry(which is a main sub. For PCM and CBZ)…can i still give improvement exam in all subject or i had to give only chemistry? As per your query, if you have failed in Chemistry (which is the main subject), you will not be eligible to appear for Improvement exam for Chemistry. Improvement exam is for those subjects in which you have scored less and you want to increase your marks but you have passed in those subjects. You will be able to give the Improvement exam in one or more than one subject. i have passed 12th in 2018 if i give improvement exam in 2019 .which year of passing class will be mentioned on dmc? The passing year i.e. 2018 will be mentioned on DMC. is it necessary to give improvement exam for all 5 subject to fulfill JEE norms so that i can eligible to take admission in any NIT,IIT by clearing entrance examination? No, it is not compulsory to take improvement exam of all 5 subjects. You can choose either 1 subject or more than 1 subject for CBSE improvement exam.